You've sauteed veggies, baked a casserole, cooked up a terrific omelet—and now it's time to wash the dishes. When you look at the pot or pan, you realize that your wonderful meal has left you with a nasty case of burned-on crud. What can you do now? Steel wool is an option, but of course, it's also incredibly harsh on non-stick pots. Hot water helps, but it's not enough. And who wants to throw out their cookware on a regular basis? There are plenty of products out there that purport to do a great job with burned-on food, but most are fairly expensive. But there are other options! Surprisingly, the best solutions to burned-on food in a pot or pan are all-natural and easy. They're built around the idea that heat plus abrasive substances can do the trick. Vinegar is an acid, and baking soda is an abrasive. Together, they can help you save your pots and pans. Start by boiling a mixture of vinegar and water in the pot or pan. This will loosen the burned on food. 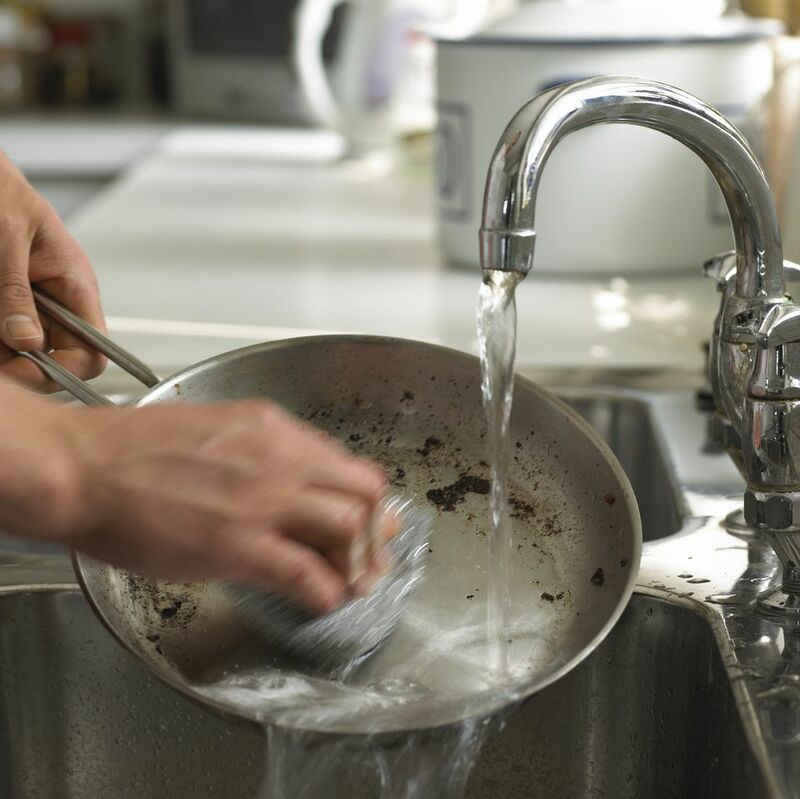 Carefully remove the pots and pans from heat, dump out the liquid and add baking soda. When they have cooled enough, scrub pots and pans with more baking soda and a plastic scrubber. Alka-Seltzer is an amazing workhorse of a product. Not only can it relieve indigestion, but it can also help you clean a surprising range of things around the house, including burned-on food. Just put hot water in your pot or pan, add about 6 Alka-Seltzer tablets, and let them fizz. ​The citric acid in the Alka Seltzer will start to work. When you return after an hour or so, use hot water, detergent, and a strong scrubber to clean off almost any mess. Here's a strange-but-true option for cleaning grungy pots or pans: use a new or used dryer sheet! It's not quite clear why this works, but many home-making mavens including Martha Stewart swear by the method. Simply put a dryer sheet into a pot with hot water, wait an hour, and scrub. The mess will be much easier to manage. Once you've cleaned and dried your pots and pans, it may be worth your while to invest in a good wooden spoon and a timer to avoid running into the same problem next time!